Continuing its legacy of introducing high-end chipset for mobiles, QUALCOMM Incorporated QCOM recently launched its new processor — Snapdragon 855, at its Snapdragon Technology Summit in Hawaii. This latest generation of mobile phone processor chips will power 5G smartphones in the United States next year. The company believes that the chip will appear in the first wave of 5G phones as this new platform will support “multi-gigabit” download speeds on 5G networks. The key feature of Snapdragon 855 chip is a modem for phones to connect to 5G wireless data networks with mobile data speeds of up to 50 or 100 times faster than current 4G networks. Being the largest supplier of mobile phone chips, Qualcomm maintains a distinctive position in the mobile space, particularly in the United States. This, in turn, should help it achieve its target of introducing Snapdragon 855 in most major flagship smartphones in 2019. The company further claimed that the chip will provide “up to three times the AI performance compared to the previous generation mobile platform” and it will add a new computer vision processor for intelligent cameras. It is also expected to improve gaming and augmented reality for better customer experience and will support a new Qualcomm fingerprint sensor that can read a user’s fingerprint through the glass screen of a smartphone. Meanwhile, communications service providers are investing in their 5G networks to generate new sources of revenues and are looking to capitalize on growth opportunities by selling 5G phones and data plans to recover costs. Supposedly, the Samsung phones would be a major challenge for Apple Inc. AAPL — its biggest rival in the premium handset market in the United States — as the iPhone maker is locked in a legal battle with Qualcomm. According to sources familiar with the matter, Apple would wait until at least 2020 to release its first 5G iPhones. Qualcomm is executing well operational plans across its core product businesses. It anticipates growth in its China business in fiscal 2019, particularly in the second half. More so, the product mix is improving in China despite the tariff war, with key mobile phone manufacturers in the Communist nation increasingly using its chips. The stock has outperformed the industry with an average return of 10.1% against the decline of 6.6% for the latter in the past three years. 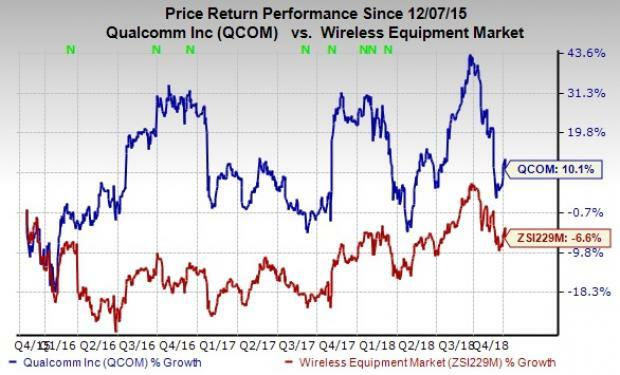 Qualcomm currently sports a Zacks Rank #1 (Strong Buy). Another top-ranked stock in the industry is Ubiquiti Networks, Inc. UBNT, flaunting a Zacks Rank #1. You can see the complete list of today’s Zacks #1 Rank stocks here. Ubiquiti has a long-term earnings growth expectation of 14%. It surpassed earnings estimates in three of the trailing four quarters, the average positive surprise being 11.3%.